PRAGUE — Việt Nam attaches great importance to developing relations with traditional friends in Central Eastern Europe, with the Czech Republic a prioritised partner. 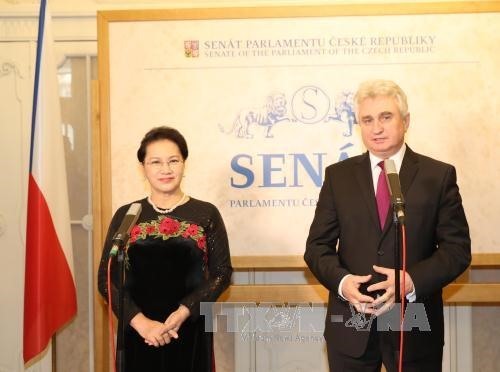 National Assembly Chairwoman Nguyễn Thị Kim Ngân made the statement during talks with President of the Senate of the Czech Parliament Milan Stech in Prague on Wednesday. She said Việt Nam remembers the assistance of the Czech state and people in the cause of national independence and reunification. The top legislator thanked the Czech parliament and government for recognising Vietnamese-Czech people as one of the country’s ethnic minority groups in 2013, calling this a valuable asset for the two nation’s friendship. She highlighted the traditional friendship and co-operation between Việt Nam and the Czech Republic over the past 67 years, which have been nurtured by the two countries’ leaders and peoples. Việt Nam is willing to create favourable conditions for Czech businesses to explore long-term investment in Việt Nam, Ngân said. The Southeast Asian country also hopes to work with the Czech Republic at regional and international forums, especially the United Nations, Asia-Europe Meeting and ASEAN-EU, she added. She affirmed that Việt Nam will help the Czech Republic enhance relations with ASEAN, and proposed the European nation support Việt Nam’s candidacy for a non-permanent seat in the UN Security Council for 2020-21. Bilateral co-operation has seen progress in various fields in recent years thanks to high-level delegation exchanges, she said. She welcomed Czech President Milos Zeman to pay a State visit to Việt Nam in 2017, a move expected to open a new period of development for bilateral amity. There is a plenty of room for the two countries to step up co-operation in economics, trade and investment, she said, noting that the Czech Republic added Việt Nam – the only nation in ASEAN – into its list of 12 key trade markets. Chairwoman Ngân proposed the Czech Republic enable businesses to sign deals to export Việt Nam’s farm produce and seafood to the market and to import industrial goods, materials and spare parts from the Czech Republic. She also called on the European country to make it easier for representatives of Vietnamese businesses to obtain visas to study the Czech market, seek partners and attend trade fairs and exhibitions. Senate President Stech said Việt Nam has the closest relations with his country in Southeast Asia. The two sides need to reach an agreement on investment protection to drive economic relations forward, he said, adding that Czech companies are willing to set up joint ventures with Vietnamese firms to boost investment in science and technology. He described Việt Nam as a successful economy in Southeast Asia, and suggested the two sides make use of their respective strengths for mutual development. Both sides agreed to push the EU to sign the Việt Nam-EU free trade agreement, which will boost trade between Việt Nam and the Czech Republic. Parliamentary co-operation has been reinforced over the past few years thanks to regular high-level delegation exchanges. The host and guest agreed that the two countries’ legislative bodies should increase rapports at multilateral parliamentary forums such as Inter-Parliamentary Union and Asia-Europe Parliamentary Partnership. Việt Nam and the Czech Republic will coordinate to monitor the implementation of co-operation agreements and projects signed between the two countries’ governments. At a meeting with the press, the two sides affirmed that they reached consensus in various fields, and the co-operation potential is enormous. Chairwoman Ngân said leaders of the Vietnamese and Czech legislative bodies had a candid discussion on issues of mutual concern. President Milan Stech said both sides agreed to create a legal investment protection corridor for private enterprises. With a large population and high economic growth, Việt Nam can attract Czech investors, he added.